For the past four years, my friend and I get the kids together during the March Break for our annual tradition - painting pottery at Crock a Doodle. The kids love it and we enjoy watching their artistic talents mature year after year. My kids had an added bonus of painting during our Summer at Blue stay at Blue Mountain in Collingwood. The projects in the photo have yet to be kiln-fired and glazed but they still look cute, don't you think? If you live in Toronto and want to check out a Crock a Doodle studio, the nearest location would be in Oakville. But rumour has it there will a couple of studios opening up in Toronto soon! By the way, check out this cute idea for an Easter-themed mug. Do you have any March or spring break traditions? Looks like fun and sounds like a great tradition! It really is! We live an hour apart so we don't get to hang out as often as we would like. Looks like lots of fun! Happy WW! Yes, until my daughter complained about the shade of pink she chose for her cupcake. I had to help my 5yo with his truck. It's a piggy bank! I can't wait till my little boy is old enough to enjoy this! Yes, it's probably better to wait till he's old enough to sit still for longer than 5 minutes. I always have to finish my son's project and they're not cheap. What a fun tradition! Very cute! Looks like fun! It's autumn here. I absolutely love the cupcake!! I've wanted to do something. Like this with my Kiddies for a while now. Looks like so much fun!! It's definitely worth trying at least once. The hard part is trying to pick just one. The cupcake is practical because it's a trinket box - the top comes off. We had a couple of playdates, too! Even if mommy had to finish it. LOL Hope you enjoy the rest of the week, too! My daughter would love those owls. Thanks for sharing. Happy WW. Aren't they so stinkin' cute? I love crock a doodle. I had ds do a handprint on a mug there 2 years ago and it has kept really well! Very fun! 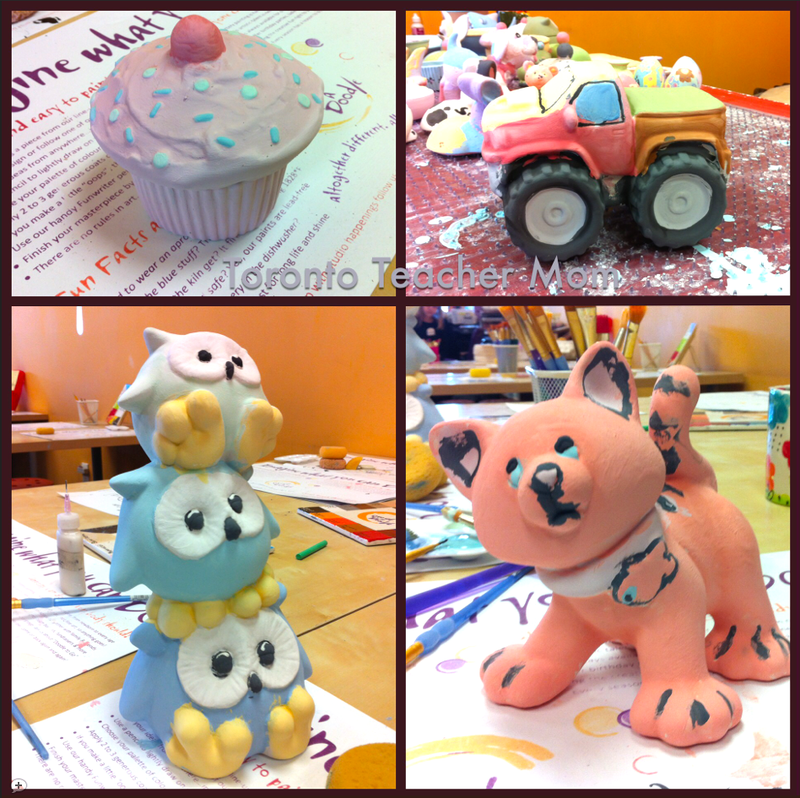 We buy clay and do our own masterpieces at home, of course it's not fired clay. I don't even know that we have anything like this around. I know we use to in the last city I lived in and a friend and I made that our little get away spot. That looks like a lot of fun! Have a great week. I have never tired painting pottery and it looks so fun!! Good tradition, bet you have lots of fun pieces for memories! Oh these are adorable. Painting pottery is a lot of fun - my boys really enjoy it too! Will you be posting the pics. after they've been fired? Would love to see them. How fun! At first I thought they were 3D cakes. They will look good in your house. That's a fun thing to do over the break. Great idea. Those paint places are fun. Cute! I love the owls! That is a very good tradition! You all did a great job! I haven't heard of Crock-a-Doodle, but have gone to Bisque It and had a lovely time. What a nice tradition! This is a really nice idea! Great way to spend time together and have the kids show there individuality through crafts! Love it!